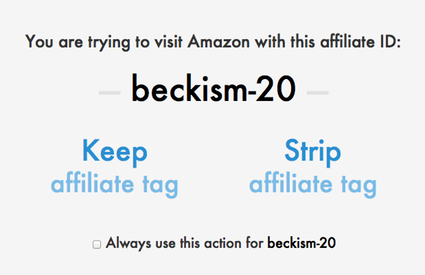 A while back, I experimented with using Amazon affiliate links on Beckism.com whenever I wrote up a short review of a product. I figured as long as I was linking to products anyway, I may as well get a kickback if people bought them through Amazon. However, over time I realized when I visited other sites that did similar things that I really hated it, and I stopped publishing Amazon affiliate links. Clearly marked affiliate links are one thing; I have no problem with sites that review a product in depth and at the end say something like, “Hey, if you buy this product through this link I’ll get a little kickback.” It’s a great way to thank blog authors for taking the time to write an article that introduced you to a product you expect to love. But all too many sites will route you to Amazon affiliate links without any sort of warning, and that just feels incredibly skeezy to me. For me, discovering that I’ve clicked an Amazon affiliate link without prior warning throws into question the veracity of the site where I found it. Is this product actually something I will enjoy, or were they just looking to make a quick buck? The problem is particularly acute on Twitter and elsewhere where shortened URLs have thrived. Often, it isn’t possible to discover if a link is an Amazon affiliate link until you’ve clicked through it. Personally, I like having control over whether or not I am going to give someone a kickback through an Amazon affiliate link, so to that end I created Affiliate Me Not: a new Safari extension that does just that (note: requires Safari 5.1). This way, you get to decide if you want to use the affiliate link or not, and if you check the “do this by default” checkbox you won’t have to see the interim screen the next time you click on a link with that particular affiliate tag. You can additionally control which tags are whitelisted or blacklisted in the Safari Preferences (using a comma-delimited strings of tags). You can download Affiliate Me Not, or view the source code if that’s your sort of thing. Enjoy! Maybe you are a bit paranoid. Does it really matter if you buy something from Amazon or buy something from Amazon? You are not paying the person who referred you to Amazon. Amazon is paying the person as a thank you for referring you to their site. As you might have noticed, had you read my post, what I object to is not sites that use clearly marked affiliate links (in which case I know what I’m getting into), but sites that are effectively spamming affiliate links (and I expect to find out more about whatever they are linking to, not get tricked into clicking through to Amazon). If you do not care about this, don’t download or use the extension. I’m frankly unsure why you are at this page or commenting at all if you personally don’t find it useful. Could you please update “Affiliate Me Not”. It doesn’t work anymore with Safari 10.0.1 on macOS 10.12.1. I’ll try to take a look! Might take me a little time, though; life is pretty busy at the moment!